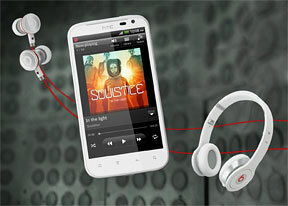 The HTC Sensation XL packs an 8MP camera that does stills of up to 3264x2448 pixels and records 720p video @ 30fps. There’s a dual-LED flash / video light too. The camera interface is very space efficient - even more so after the Sense 3.5 update. Most of the controls are on the right side of the viewfinder, with the virtual shutter in the center. The still/video toggle and front/back camera toggles have been combined in a single menu and the Effects button has been moved to the top left corner - this freed up space for the Scenes and Settings button. There’s a gallery shortcut (a thumbnail of the last photo taken) in the bottom left corner and a virtual zoom lever along the bottom. By default the viewfinder image is cropped so that it fills the entire screen, but you can switch that off (note that cropping reduces the resolution). The Scenes are pretty cool - especially since they grew an extra feature, Backlight HDR, which previous versions of HTC's camera software lack. We tested it, you can check out the photos below. The HTC Sensation XL has face detection and touch focus. Continuous autofocus is enabled too which is good to have on a phone like the Sensation XL with no hardware shutter key. On the downside, the continuous autofocus may be way off in some shots - the only way to be certain you have the right focus is to tap and hold the shutter key. Geo-tagging is an option too as is Auto upload - all you have to do is pick a service (Facebook or Flickr), an album and when to upload (Immediately, daily and Wi-Fi only), the phone will take care of the rest. The effects button brings out a panel on the left with the usual set of color effects (sepia, solarize and so on). There are other image effects too. For example, Warp places a control point on the screen, which you can drag with your finger and see the result in real time. Depth of field is another such effect – it adds a radius slider besides the control point and will blur everything in the photo that falls outside the circle. Contrary to what we expected, the HTC Sensation XL produced much better photos than the Titan. We think the key is better image processing (as we're all but sure that both phones use the exact same camera module). The noise reduction treads lightly leaving fine detail mostly untouched. There's visible noise but not all that much (a small percentage of that noise is of the color noise variety). The dynamic range isn't all that wide, which leads to clipping (most common in the highlights but present in the shade too). The color balance is quite accurate but the Sensation XL does oversaturate colors to make them pop. There are traces of oversharpening and some purple fringing visible in the photos too, but shots usually turn out very good. We've got a bunch of samples below. And here's the HDR sample. It really improves the camera's performance in resolving the shades. The camera takes several shots, so for best results you should use a tripod. It also works best for static scenes - you can see the "ghosting" in the moving cars. The fist image is a 100% crop from HDR and non-HDR shots to highlight the differences between the two modes. The HTC Sensation XL enters our Photo Compare Tool to join the other 8MP shooters. The tool’s page will give you enough info on how to use it and what to look for. The ISO chart shows the slightest trace of a pink spot but otherwise the XL does pretty well in synthetic resolution. The next chart makes the noise pretty visible in its flat grey color - also the patches to the right show how lightly the noise reduction threads. The final chart show pleasing (if oversaturated colors). The interface of the camcorder is similar to the still camera’s and there are lots of customizable options with this one. You can set the video resolution, recording limit and add effects. Autofocus works here too, but only before you start shooting – then the focus is locked and won’t change unless you tap an area on the screen, which will cause the camera to refocus on that area. One new feature here is the 2x slo-motion mode - it only works for resolutions up to WVGA. This mode also disables the audio recording. Our unit had a problem and recorded videos at 8fps, so we can't post a sample. You have effects for videos too - Grayscale, Sepia, Negative, Solarize, Posterize and Aqua. Once you're done recording, you have an option to trim the beginning and the end of a video in case you started too early or you let the recording run for too long. Videos are shot in .MP4 format in 720p resolution at 25 frames per second (instead of 30fps). Still the Sensation XL's videos were mostly smooth with only the occasional jitter. The videos have a relatively low 5.2Mbps bitrate, but at least they're recorded with stereo audio (130Kbps bitrate at 44.1kHz sampling rate). The video quality isn't bad for a 720p shooter, but the high compression does away with most of the fine detail. There's clipping in the shadows and highlights (again) and the colors come out oversaturated. Unlike the still camera, videos from the Sensation XL and the Titan are close in terms of quality (though the Titan did hit a higher frame rate of 30fps). Here goes an untouched sample 720p@30fps clip (0:16s, 10.9MB). We entered the HTC Sensation XL in our Video Compare Tool database too and put it head to head with other 720p mobile camcorders. You can spot that the compression is heavier in the shades than in well-lit areas. In the dark, color noise is apparent and fine detail is lost. The third chart shows there's more to be desired from the video's resolution - and that frames are oversharpened. The HTC Sensation XL has a complete connectivity set. There’s quad-band GSM/GPRS/EDGE and blazing fast dual-band 3G: 14.4Mbps downlink and 5.76Mbps uplink thanks to HSPA. The local wireless connectivity has Wi-Fi b/g/n and full DLNA support (both client and server, for images, videos and music) and Bluetooth 3.0. The Connected media app handles all sorts of DLNA connections – it plays media to and from devices on the network with just a couple of clicks. Apps like the Gallery and music player have such functionality built in too. You have a long list of options for connecting to a PC - Charge only, Disk drive (mass storage), HTC Sync, USB tethering (use the phone as a modem) and Internet pass-through (the phone uses the computers Internet connection). The Charge only and Disk Drive now have big, thumbable icons, which is great since they are used most often. Last but not least is the HTC Portable Hotspot. It can support 1 to 8 devices, you can WEP, WPA or WPA2 encrypt the hotspot and you can enable “allowed users” only to connect or leave it open for all (unsecure, but the quickest setup). We didn’t encounter death grip issues with the Sensation XL - if you cup the phone, the wireless indicators go down a notch, but the signal still goes through. We wish the Sensation XL had MHL connectivity to connect to HDTVs like its XE sibling has.